(2018) Vol.24,No.1 / Vol.24,No.2 New!! 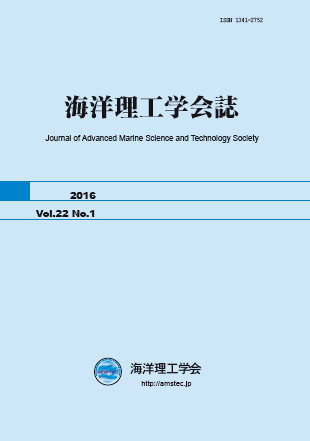 [原著] Analysis of the microwave readiative transfer process in a snow layer on sea ice using the "Two-Flow" theory. William G.Pichel, Pablo Clemente-Colon, Karen Friedman, Arleen C.Lunsford, George A Leshkevich, Gary Hufford, Garla Neigh, William Y.Tsene, Robert N.Stone, Xiaofeng Li, pp.147-164. Chao Fang Zhao, Masatoshi Akiyama, Yasuhiro Sugimori, Jun Suwa, Ming Xia He, pp.175-184. Kevin B.Smith, Jose G.Rojas, James H.Miller, Gopu Potty, pp.205-216. Naoya Suzuki, Naoto Ebuchi, Masatoshi Akiyama, Jun Suwa, Yasuhiro Sugimori, pp.217-224. Taerim Kim, Masatoshi Akiyama, Yasuhiro Sugimori, pp.225-240. Leonid Mitnik, Ming-Kuang Hsu, pp.241-248. Pablo Clemente-Colon, Donald R. Montogomery, William G.Pichel, Karen S.Friedman, pp.249-258. Hui Feng, Janet W.Campbell, Timothy S.Moore, pp.265-274. Y.S.Suh, S.D.Hahn, Y.Q.Kang, B.G.Mitchell, pp.275-280. Andrei Yu.Ivanov, Konstantin Ts.Litovchenko, Stanislav A.Ermakov, pp.281-288. Xiao-Hai Yan, Yun He, R.Dwi Susanto, W.Timothy Liu, Hui Lin, pp.289-300. A.M.Zapolsky, V.P.Dzyuba, G.I.Dolgikh, F.A.Zapolsky, pp.307-312. Yunhe Zhao, Antony Liu, Cathleen A.Geige, pp.313-328. Bingquan Chen, Knut Stamnes, Banghua Yan, Oyvind Frette, Jakob J.Stamnes, pp.329-338. Ayako Nishina and Masao Fukasawa, pp.1-10. Masahisa Kubota, Tetsuhiko Okamoto, Katsuki Hirabayashi and Hidekazu Yokota, pp.11-22. Rui Chen, Masatoshi Akiyama, Yasuhiro Sugimori, Naoshiro Matsuura and Ming Xia He, pp.23-34. 堀口文男，中田喜三郎，Pil-Yong Lee, Woo-Jeung Choi, Cha-Kyum Kim,寺澤知彦, pp.81-94. copyright©2013 Advanced Marine Science and Technology Society all rights reserved.